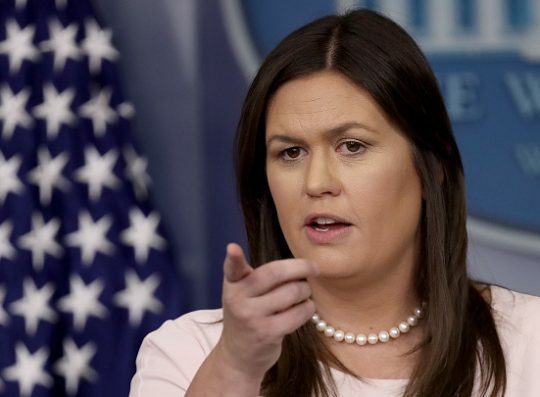 White House press secretary Sarah Huckabee Sanders on Monday issued "rules that will govern White House press conferences going forward" in response to the behavior of CNN's chief White House correspondent, Jim Acosta, earlier this month. Sanders laid out three rules for reporters in attendance at future press conferences, adding that if they fail to comply with any of the rules, they may face "suspension or revocation of the journalist's hard pass." The three rules include: limiting reporters to one question before they must yield the floor to other journalists; asking a follow-up question or questions only at the discretion of President Donald Trump or another White House official answering questions, before then yielding the floor; and "physically surrendering the microphone" to White House staff when applicable for the next questioner. NBC News White House correspondent Geoff Bennett tweeted out the full press release. "We have created these rules with a degree of regret. For years, members of the White House press corps have attended countless press events with the President and other officials without engaging in the behavior Mr. Acosta displayed at the November 7, 2018 press conference," Huckabee Sanders said in a statement. "We would have greatly preferred to continue hosting White House press conferences in reliance on a set of understood professional norms, and we believe the overwhelming majority of journalists covering the White House share that preference." Sanders went on to say the White House is "mindful" a more comprehensive list of rules may need to be created, but added they "have decided not to frame such rules in the hope that professional journalistic norms will suffice to regulate conduct in those place." The White House suspended Acosta's press credentials earlier this month following a heated interaction with Trump at a press conference during which Acosta refused to give up the microphone to a White House intern after an aggressive series of questions. Trump repeatedly told Acosta to sit down, but the reporter refused to yield the floor. CNN filed a lawsuit last week against Trump and top aides in the White House, including chief of staff John Kelly, Huckabee Sanders, deputy chief of staff for communications Bill Shine, the director of the Secret Service, and the Secret Service officer who revoked Acosta's hard pass. Ted Olson, an attorney for CNN and Acosta, said Acosta's press credentials "must be restored so that all members of the press know they will remain free to ask tough questions, challenge government officials, and report the business of the nation to the American people." Federal District Judge Timothy Kelly, who was nominated by Trump, granted CNN’s motion for a temporary restraining order last Friday that would overturn the ban of Acosta from the White House grounds. Early Monday morning, however, the White House told CNN that it intends to revoke Acosta's press credentials again at the end of the month. The White House has since reversed this decision, fully restoring Acosta's credentials if he abides by the new rules that Sanders released. As a result, CNN dropped its lawsuit. "Today the White House fully restored Jim Acosta's press pass," CNN said in a statement. "As a result, our lawsuit is no longer necessary. We look forward to continuing to cover the White House." This entry was posted in Politics and tagged CNN, Donald Trump, Jim Acosta, Media, Press Briefing, Sarah Sanders, White House. Bookmark the permalink.